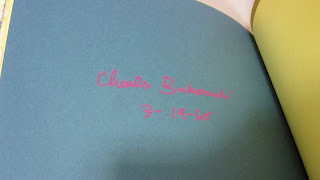 I recently was able to find a copy of Charles Bukowski's fifth book, Crucifix in a Deathhand, published in 1965 by the Loujon Press of New Orleans. Earlier this year, I featured another Loujon Press title, Henry Miller's Order and Chaos Chez Hans Reichel, which at the time floored me like no other book in my collection. And somehow, the Loujon Press has managed to wow me even more with Crucifix. I think every book collector must encounter in their journey some acquisitions that force a certain degree of pause and reflection. This is that book for me; it's shown me that my "collecting"--which was once really nothing more than a hobby--has turned into something so much bigger and so much more special than I ever thought possible. It's a wonderful feeling to find the book that becomes the "nicest" book in one's collection. It's not the most valuable, sure, but just hold Crucifix in your hands and you can feel the unbridled passion for craft that the Loujon Press had. These pictures will surely not do enough justice, but they'll have to do. If you flip over the book, the wrappers open up to reveal a bound book inside--the black cover at the top of this post is actually the book's back cover. Similar to Order and Chaos, the preliminary pages feature the book's introductory notes printed on about ten pages of colored pages with roughly torn edges. The book begins with a facsimile of Bukowski's title poem--click above and you can read some. The book also was originally packaged with a little paper wrapper, depicted it's original price tag of $7.50 and a great blurb (above). As you can see, the book's typography is stunning as well. Crucifix also includes a handful of etchings done by an artist named Noel Rockmore. They're pretty strange, but they fit the overall feel of the book perfectly. Lastly, the book is signed and dated (3-19-65) by Bukowski on one of the final pages. Hope you enjoyed taking a look at this! It's a real treat to be able to share it with you, hope you like it as much as I do. While there were 3100 copies of this book printed, the book is still pretty rare. I found this copy on eBay, and made a random there's-no-way-they'll-accept-it best offer. Keep an eye out and make an offer when you see one... you might be surprised by some sellers. I knew Jon and Gypsy Lou in Tucson, and visited their adobe storefront several times while they were in operation. All pages were printed on Jon's foot-operated treadle press with hand-set type. Truly a labor of love. I still have several of the books.